Mediterranean river discharge patterns depend on properties of the atmospheric water budget as well as on the geographical characteristics of the Mediterranean catchment. A substantial latitudinal gradient characterises Mediterranean precipitation year-round, with dry areas along the African coast and significantly wetter ones north of the Mediterranean Sea (Struglia et al. 2004). 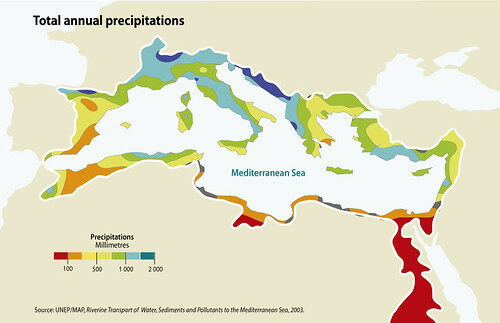 Winter is the main rainy season for the European land regions, which contribute most of the discharge, while summers south of 40 degrees N are basically dry. Most of the water discharge in the northern region occurs during short floods associated with maximum river flow after heavy rainfall, which generally occurs between February and May. The strong summer-winter rainfall contrast, which increases from north to south and from west to east, is the major characteristic of the Mediterranean climate (UNEP/MAP/MED POL, 2003). In the large and medium-sized river basins in north and central Europe, wide-ranging and continuous precipitation is the most common cause of flooding. Floods also occur in association with snow melt in late spring and early summer. Intense shortlasting rainfall during spring and fall affecting small coastal catchments is the main cause of coastal floods in arid and semiarid parts of the Mediterranean area.